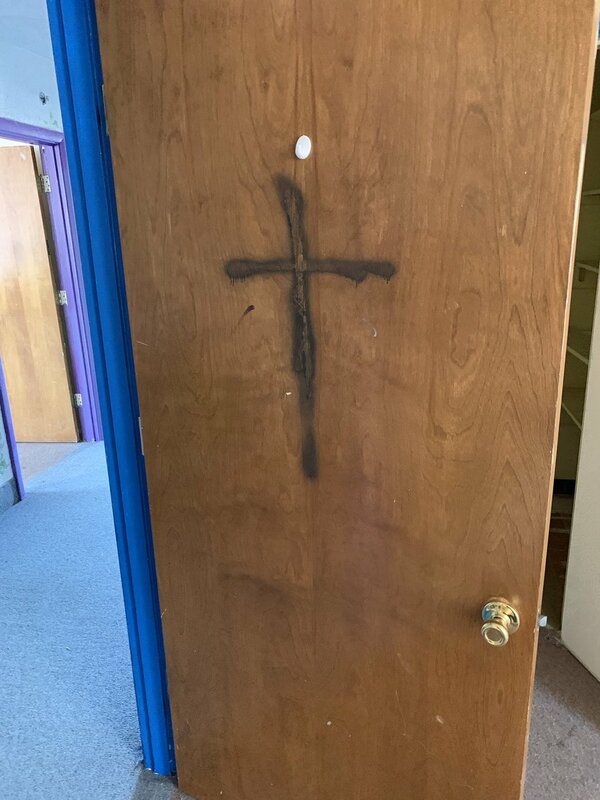 In a hate crime, a Hindu temple has been vandalised in the US state of Kentucky by miscreants who sprayed black paint on the deity, wrote graffiti like ‘Jesus is the only Lord’, and left a knife stabbed into a chair in the main hall. The incident happened between Sunday night and Tuesday morning at the Swaminarayan Temple in Louisville city, news agency PTI has reported. 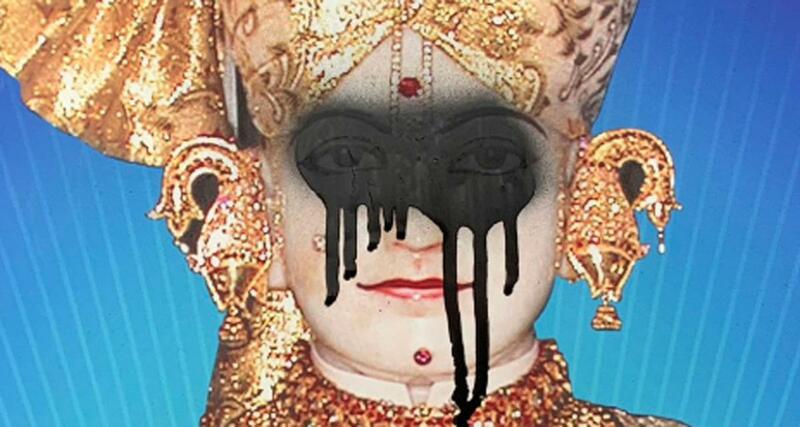 The vandalism resulted in deity image sprayed with black paint, broken windows, walls spray-painted with inappropriate messages and graffiti. 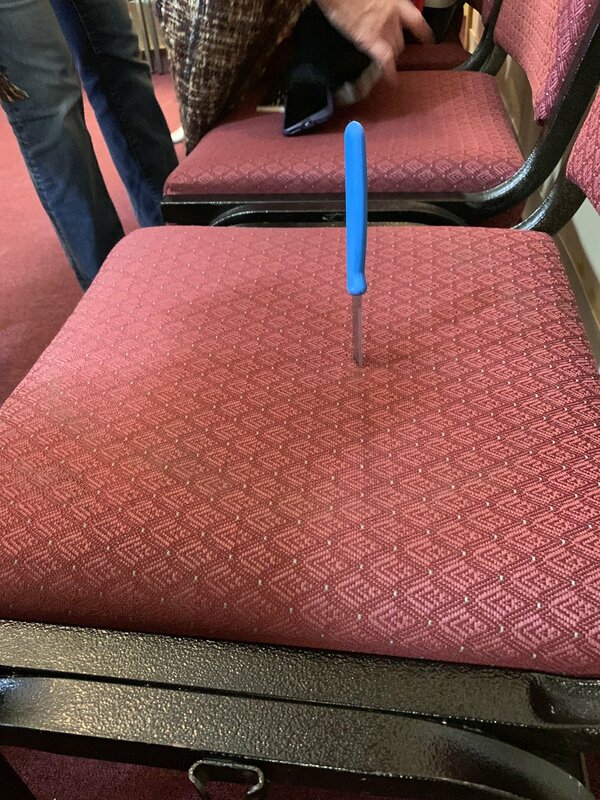 A knife was stabbed in the chair, and cabinets were emptied. 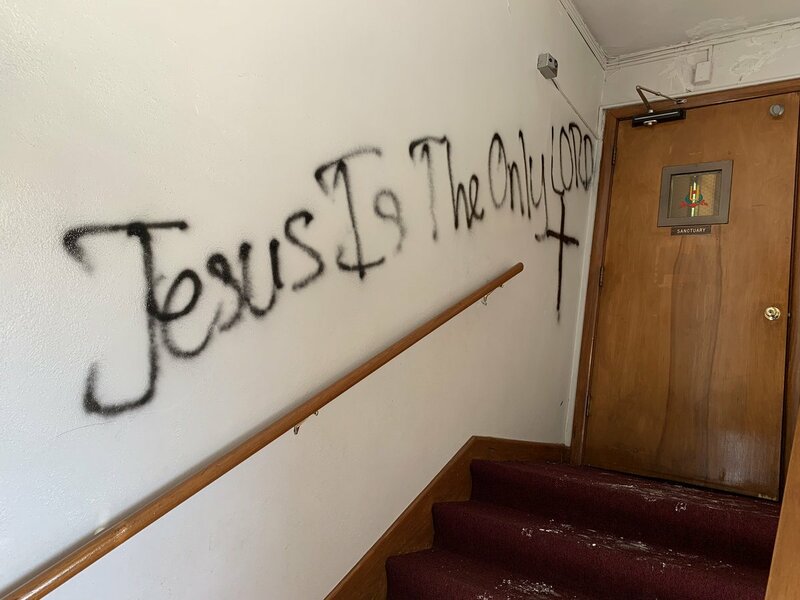 While the PTI report is silent about the exact content of the ‘inappropriate messages’, local US media outlet wave3.com informs us that the majority of the messages were different variations of the phrase “Jesus is the only God.” There were also expletives spray painted in another room. 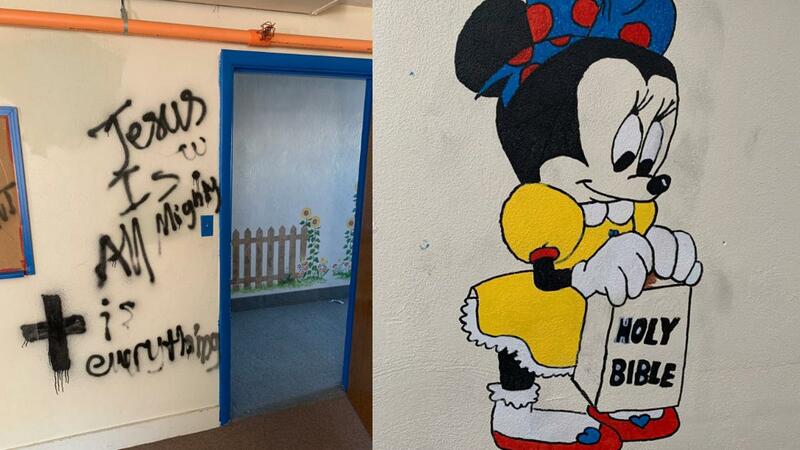 The Christian cross was also spray pointed on various walls. A children’s playroom in the temple premises was also not spared. The incident has sent shock waves through the Indian-American community in Louisville Kentucky. Authorities are investigating the incident as a hate crime. Condemning the incident of vandalism, Louisville Mayor Greg Fischer called upon the city residents to stand up against this hatred. “Regardless of what religion you are, this should not happen,” Raj Patel from the Swaminarayan temple said. “We come here to worship. We should not have to turn our backs to see who is behind us, but we should be happy to come here and worship in peace,” he added. Defilement of Hindu temples and breaking of murtis (incorrectly termed ‘idols’ by Abrahamic supremacists such as Christian evangelicals and Islamists) is a common occurrence across the world, with such incidents being reported from places as wide apart as Fiji, Australia, Bangladesh, Pakistan, Bharat, Mauritius. For fundamentalist adherents of Abrahamic faiths like Christianity and Islam, there is possibly no greater sin than ‘idol worship’ and hence Hindu temples are an easy target for their hate and bigotry. They believe that as per the tenets of their religion, non-believers are bound to burn for eternity in hell, and hence they are doing a favor to ‘heathens’ like Hindus by proselytizing and bringing them ‘good news’ from the Bible. 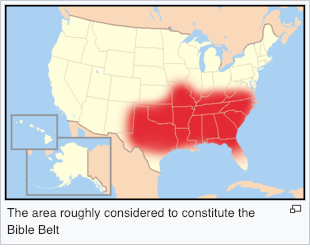 It is not surprising that this religious hate crime took place in a state like Kentucky, which is considered part of the ‘Bible belt’, a region in the Southern United States where evangelical Protestantism plays a strong role in society and politics. Evangelical Protestant denominations like Pentecostals are some of the most aggressive missionaries who use every means possible to convert non-Christian indigenous populations by denigrating their traditional beliefs, in a well co-ordinated, well-funded international mission that uses modern management techniques like the theory of the ‘10/40 window‘ to achieve their end goal. Yet, if one reads the influential Western media, one will scarcely hear about this sustained campaign of hate and bigotry directed against Hindus, who ironically are one of the most well-educated, integrated, hard-working and peaceful communities wherever they have settled in the world. In 2015, a few random incidents at churches in Delhi involving short-circuit, drunkards breaking a window pane, petty theft were blown up to drive mass hysteria of ‘Christians under attack’. The propaganda was instantly picked up the Christian news network and even made it to mainstream media in the West. Even the then US President Barack Obama weighed in, claiming that ‘Mahatma Gandhi would have been shocked at the acts of intolerance in the country famed for its diversity’. But while the US Government is quick to take up cudgels for any perceived or actual persecution of Christians, and Islamic countries do the same for Muslims, whether anyone in a position of power speaks up for this assault on the Hindus of Louisville, remains to be seen. Most Hindus have internalized their second-class global position to such an extent that they are reluctant even to condemn the message “Jesus is Lord” spray-painted on their temple wall, fearful that this will offend the majority Christians in their adopted country. Unless we rediscover our self-respect and start asserting our right to equality and a dignified existence, things are unlikely to change.